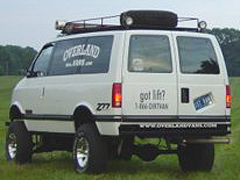 Welcome to Overland Vans. Our motto is "Dare to be Different" and we specialize in outfitting vans for work and play. We are working to change the image of these underestimated and versatile rigs. It's time to set yours free and start enjoying the ultimate sport utility vehicle. We have outfitted photographers, contractors and surveyors to get the most out of their work vans. Not to mention all the surfers, hunters, fishermen, snowboarders, skiers, mountain bikers, kayakers, just to name a few, that depend on their Sport Utility Vans to get them where they want to be. We can help you outfit yours too. We are proud to be the largest supplier of Astro/Safari torsion bars in the country. Providing you with the OEM upgrade kit to repair your rig. Take a look at our catalog of products for more information. Visit our ever expanding photo and video gallery too. The products and vehicle modifications discussed and/or promoted by this site are for use at your own risk. Due to the nature of these products and their intended use Overland Vans and any parties associated with it will not be responsible for any claims against them. No collision studies have been performed pertaining to any of these products or the use of them on a vehicle. Off-road use of a vehicle can be dangerous. 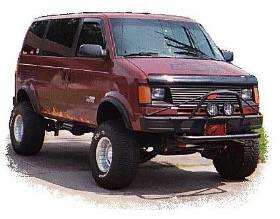 Lifting a vehicle raises it's center of gravity and therefore may be at higher risk of rollover. Caution should be used in driving any lifted vehicle. Use caution also in installing any products to your vehicle. Failure to properly support a vehicle while working on it could result in injury or death. Due to the great support, encouragement and a huge influx of requests for our products Overland Vans will remain open for business. I will be working to create a Face book account so as to better serve you and to help me gauge the desire for our products more accurately. This may take me a little as I have said before I can hardly spell HTML. This will help me communicate with all of you. I stand by what I said in the previous announcement that it has been a wonderful experience serving all of you. There will be a little delay in sending out the next few orders as I restock our inventory. Once again we offer you our heartfelt gratitude.